You are hereHome Welcome to #GlobalJustice! 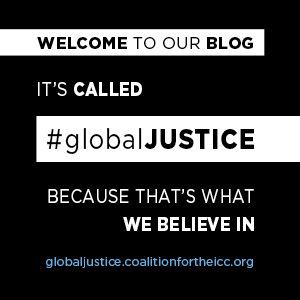 Welcome to #GlobalJustice – the new blog of the Coalition for the International Criminal Court. #GlobalJustice aims to provide experts and non-experts alike with the latest news and civil society views on the ICC and Rome Statute system of international justice. It will host regular updates on all ICC cases and situations as well as developments in the fight against impunity for grave crimes around the world, acting as a platform for our member organizations, particularly those operating at the local or national level. Responding to our calls to action, such as our Campaign for Global Justice. General Updates. A monthly Coalition Bulletin on ICC investigations and the fight against impunity around the world, as well as periodic news on major events, publications and campaigns. In-depth Updates. #GlobalJustice Weekly—a written roundup of ICC related news and latest blog posts—and daily summaries from the Assembly of States Parties each year. Courtroom Updates. Periodic summaries of ongoing ICC cases from our courtroom monitors. And those in need of a daily dose can follow us on Twitter with the hashtag #GlobalJustice. Advance stronger national laws that deliver justice to victims of grave crimes. We look forward to hearing from you and hope you find this blog both informative and inspiring for many years to come.